The loyal follower of The Murray Chronicles will remember the Dawson City Journal, my photo journal of three months spent in Dawson City, Yukon, and the popular post: Annie Smith's beaded moose hide slippers. Those beautiful slippers continue to be worn by the writer on an almost daily basis. Just before leaving Dawson in late December, I found some slippers at a local market. They were crafted for me by the artist Sarah McHugh. The slippers arrived after we returned from Argentina and were well worth the wait. Sarah learned her craft from two elders: her mother and mother-in-law. She has sold hand-stitched slippers and mitts to local Yukon residents, to visiting tourists, and has sold and shipped her products to people on four continents. Sarah uses only traditionally tanned moose hide because it provides a softer and much more aromatic hide with a strong wood-smoke smell. Her hides come from local tanners and include moose, elk and caribou. 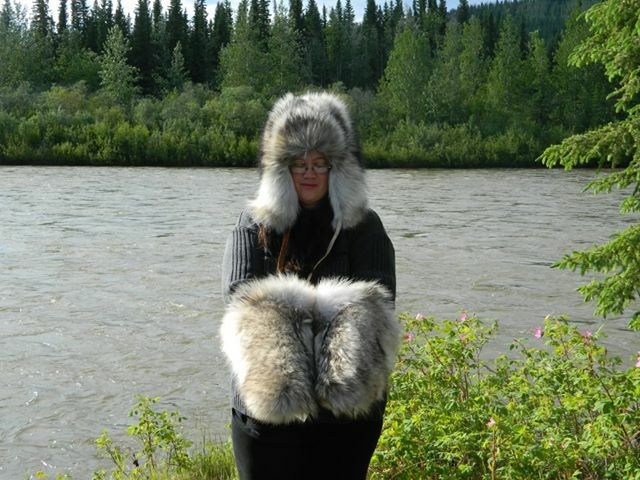 She uses furs, such as beaver, fox, wolf and wolverine, all sourced from Yukon trappers. My slippers are moose hide with beaver fur and beaver tail leather, and the smell really is fantastic: wood, smoke and moose, a constant reminder of my time north of sixty. Sarah operates under the name Mad Mitters Luxury Furs and you can see more of her work by visiting her Mad Mitters facebook page.